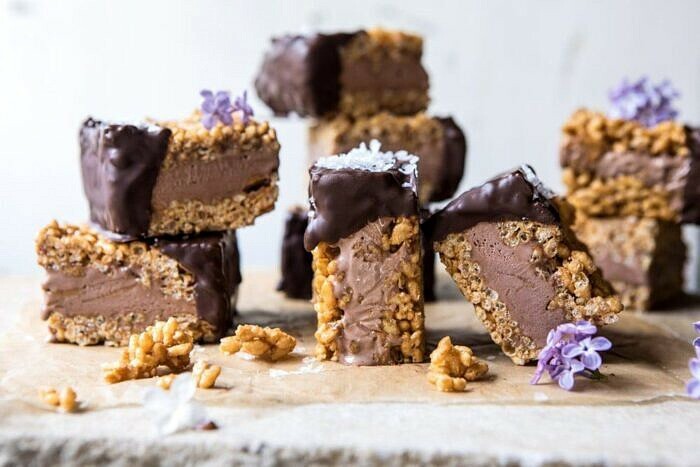 6 Ingredient Rice Krispie Treat Chocolate Ice Cream Sandwiches. 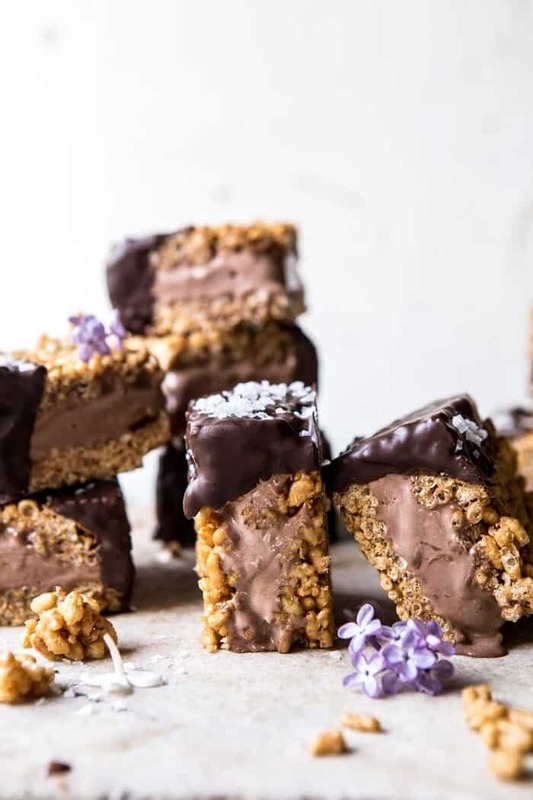 Chocolate peanut butter swirled ice cream, sandwiched between homemade rice krispie treats, frozen, and then dipped lightly in chocolate and sprinkled with sea salt. Made with just six ingredients and so delicious. 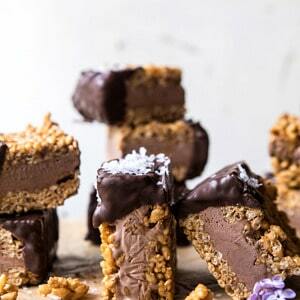 You have to make these ice cream sandwiches. Happy Friday! I’m spending my last few hours with my family here in tropical paradise before heading off to NYC this afternoon for my Anthropologie Workshop and Meet and Greet this Sunday. Are you guys coming? I’d love to meet as many of you as possible. The workshop is from 11am to 12pm and you can RSVP for that here. The meet and greet and book signing will directly follow the workshop and I’ll be there until 3pm on Sunday. This is my only meet and greet while I am in NYC, so come say hi if you can. Again, I’d love to see you all! As I mentioned, I’m leaving my family today after about 8 amazing days. We’ve traveled from Turks and Caicos up to Nassau, spent a lot of time in the sun, and most of us are very sun-kissed…me? I’m very red, with sun rashes, because apparently my skin is very sensitive to the sun. All is good though because I’ve had an awesome time off with my family and we could not have asked for better weather. That said, I’m really excited to be getting back to the real world today, and so excited to be heading to NYC, one of my favorite places! 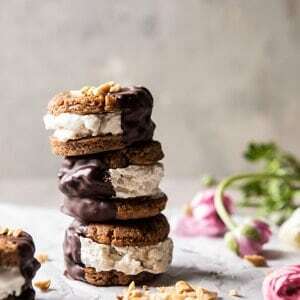 Let’s talk about these ice cream sandwiches, that are hands down going to be one of my favorite ice cream treats of the summer. These are SO GOOD. 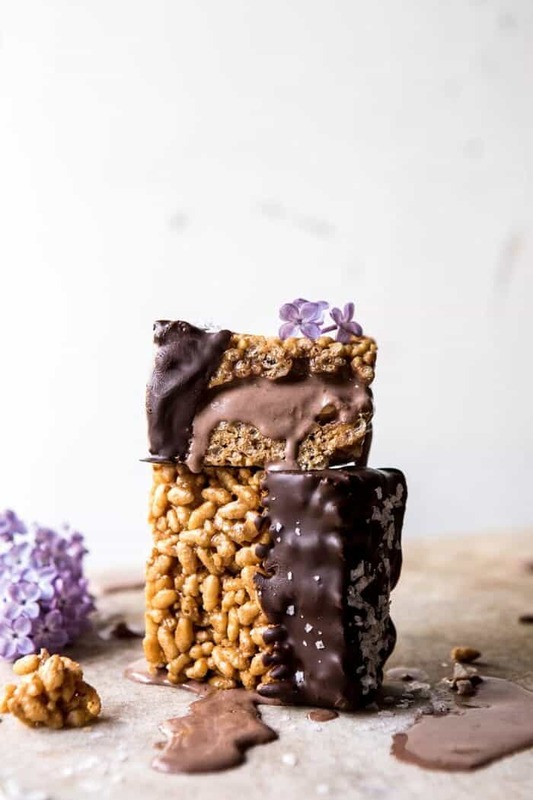 Think about it this way, sweet and creamy chocolate peanut butter ice cream, sandwiched between soft and chewy rice krispie treats, all frozen together, cut in squares, and then dipped in a light coating of chocolate shell and sprinkled with sea salt. Everything starts with the rice krispie treats. I like to make mine a little healthier than most, but don’t worry, I don’t sacrifice any flavor. 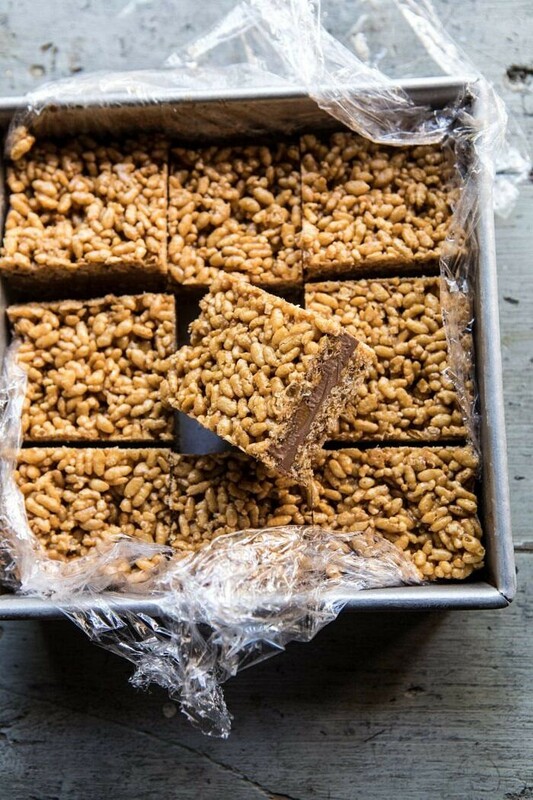 I like to use honey and peanut butter as my “glue” and then stir in the brown rice krispies. 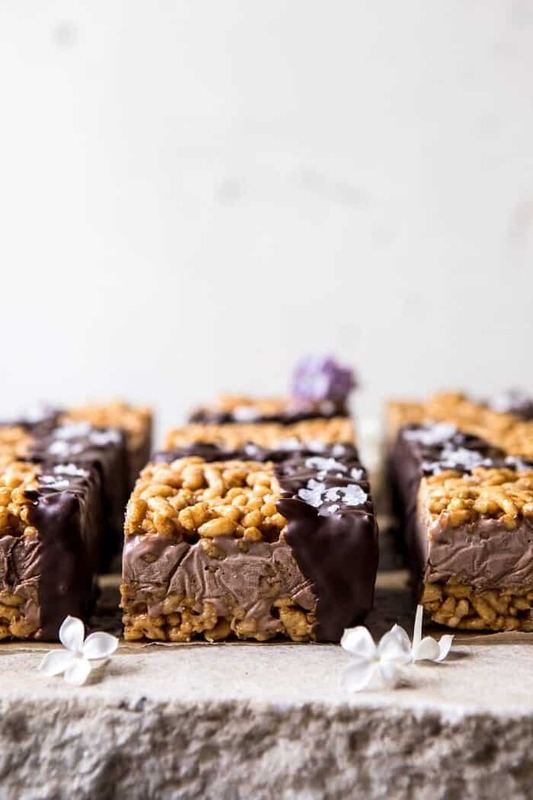 From here, I press half the krispie treat mixture into a square baking dish, freeze until cool, and then add a thick layer of chocolate peanut butter ice cream. If you ask me, the chocolate peanut butter ice cream is key. You can of course use whatever flavor ice cream you’d like, but I love the swirls of peanut butter throughout the chocolate ice cream. Plus, it pairs well with the peanut butter in the cereal layer. Once the ice cream has been added, add the remaining layer of rice krispies and freeze until firm. 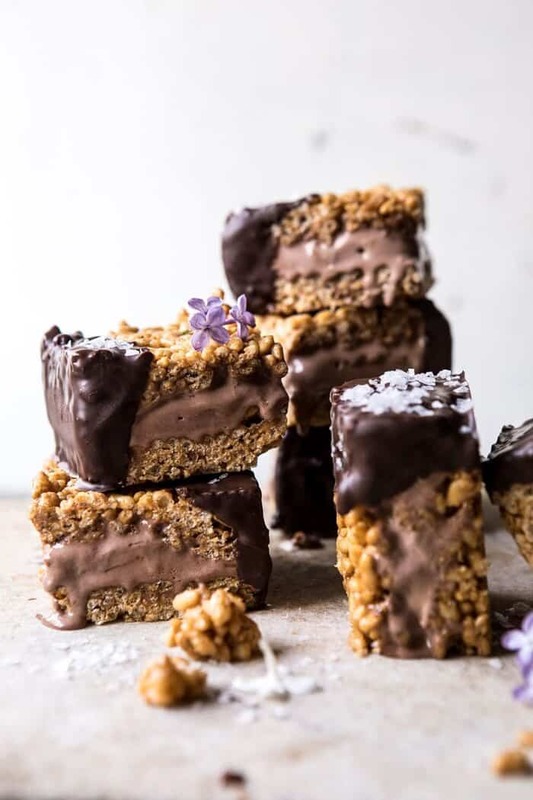 Once frozen, cut the sandwiches into bars and dip lightly in chocolate and sprinkle with sea salt. It’s not a must, but it sure is good. And there you have it, six simple ingredients (not including the salt) and super easy to make. Does not get better. Alright, now let me tell you how you should go about eating these. My dad has given me the secret trick that he says you all need to know. Warning, it’s not the most civilized way to eat an ice cream sandwich (but then none of the Gerard crew are very civilized). Place your sandwich on a plate, take a fork, press about a third of the way into the sandwich, not all the way into the center, but about a third of the way in. He says if you only go a third of the way in, the chunk of ice cream will stay positioned on your fork and you can then easily eat around the sandwich while it’s still on your fork. He says this is the most enjoyable and least messy way to eat this particular ice cream sandwich. Dad LOVED these, so you’ll have to take his word for it guys. He also said what he loved most about these ice cream sandwiches was that they stay soft and chewy even though they’re frozen. Not sure how that happens, but I think it’s something to do with the air in the rice krispie cereal. I don’t know, just enjoy them, the point is that these ice cream sandwiches are beyond good. You really need to make them. I suggest tonight, this week, again for the 4th of July. Just make them. Fair warning, these are addicting. Once you make them…you will be making them again. 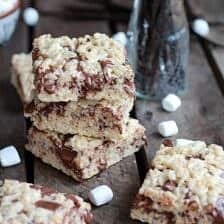 If you make these rice krispie ice cream sandwiches, please be sure to leave a comment and/or give this recipe a rating! I love hearing from you guys and always do my best to respond to each and every one of you. Oh, and of course, if you do make these ice cream sandwiches, don’t forget to also tag me on Instagram so I can see! Looking through the photos of recipes you all have made is my favorite! 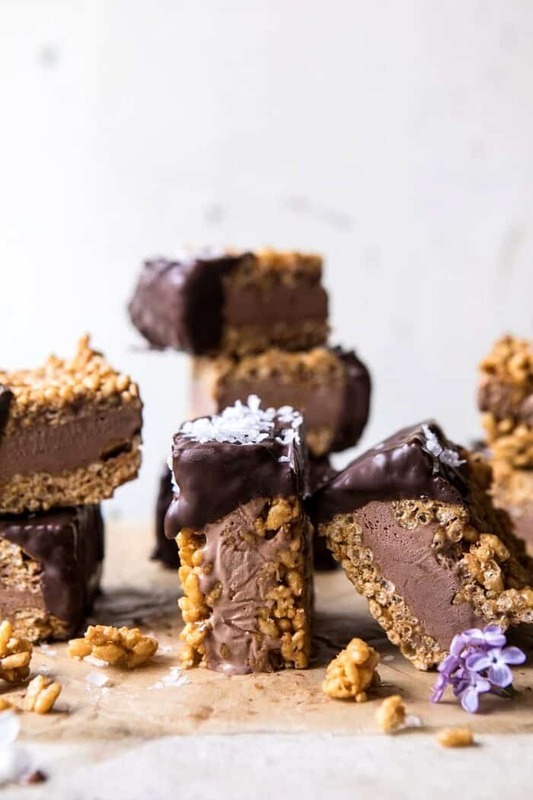 Chocolate peanut butter swirled ice cream, sandwiched between homemade rice krispie treats, frozen, and then dipped lightly in chocolate and sprinkled with sea salt. 1. Line an 8x8 inch square baking pan with plastic wrap. 2. In a large, microwave safe bowl, melt together the honey and peanut butter until smooth, about 30 seconds to 1 minute. Stir in the Brown Rice Krispies, tossing well to combine. Spread half the mix out into the prepared pan, packing it in tightly. Transfer to the freezer and freeze 5 minutes. 3. Spread the ice cream over the Rice Krispies in an even layer. Add the remaining Rice Krispies, pressing them evenly over the ice cream. Transfer to the freezer and freeze 3 hours or overnight. 4. Melt the chocolate and coconut oil together in a microwave safe bowl. 3. 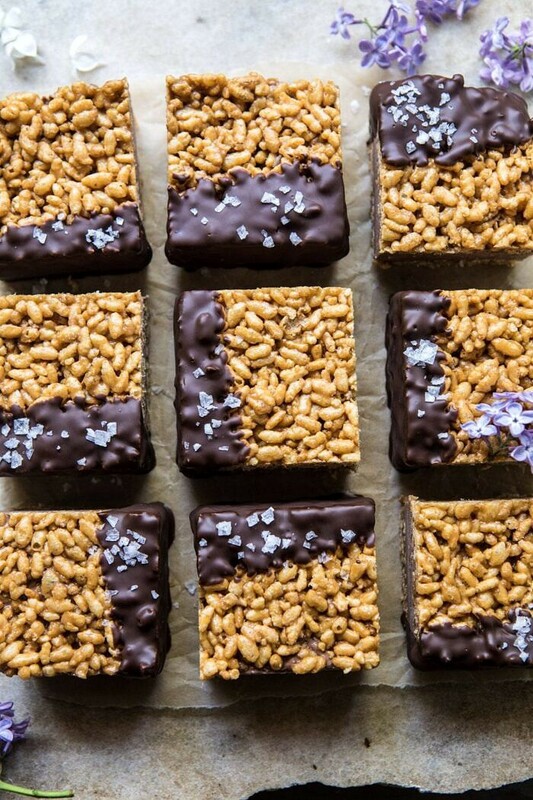 Remove the pan from the freezer and cut into 9 bars. Working quickly, dip each bar in chocolate and place on a parchment lined baking sheet, sprinkle with salt. Return to the freezer for 5 minutes. Keep stored in the freezer in an airtight container. I have absolutely left a vacation looking like a freshly plucked chicken because of some weird sun reaction. Totally feel you! These ice cream sandwiches look amazing — seriously all good things in a handheld package. Love it! Just made these for a smoked barbecue rib party tonight. So easy to make and a light but sweet finish to a hearty summer meal. They look awesome! I can only imagine if I make them it would be one Ice-cream mess! Hi Abygail! I am sure they would turn out amazing for you! 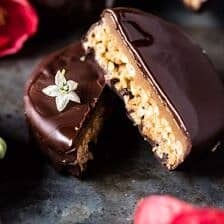 I hope you make these! My daughter and I made these over the weekend. Oh my. Delicious!! And so easy! We went for the bare-bones version, without dipping in chocolate. I know adding that extra flourish would be amazing, but we worked with what we had—and it was a huge hit! Thank you so much Janet! I am so glad you loved this! I took these to a BBQ last night and out of the four desserts offered these were to first to vanish. Enjoyed by young and old. Easy to make and look fabulous. Thank you for another wonderful recipe. hey girl- these look oh so yummy! I hope your enjoying New York! 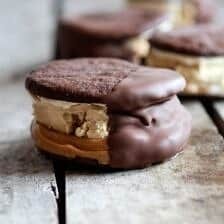 These ice cream sandwiches look so, so good! they’re also too cute to look at! If you aren’t a peanut butter fan, would you just double the honey? My friends and I had a cookbook club gathering tonight and all chose a different recipe from half baked harvest to bring and share. These treats were so delicious! !